Move over Monty Python, there’s a new show in town and its name is Norman Surplus’s Flying Circus. The daredevil Larne pilot and his little yellow flying machine are finally back on cloud nine this week following a four-year break. 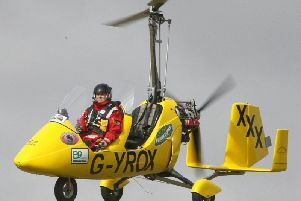 When he started his epic journey at Sandy Bay back in 2010, Norman never could have predicted he would have devoted five years (and counting) of his life in pursuit of becoming the first person to circumnavigate the globe in a gyrocopter. In that time, the bowel cancer survivor has blazed a trail across half the planet, piloting Roxy to more than a dozen countries and racking up a total of nine world records in the process. The father-of-two looked to be well on course to fly straight into the history books, but there was one constant, niggling obstacle that this Magellan of the skies was unable to outmanoeuvre – the ever-present scourge of bureaucracy. Norman spent years wrangling with the Russian air authorities – even appealing directly to President Vladimir Putin – in a bid to secure permission to fly over their airspace. But his efforts ultimately proved to be fruitless, and he was forced to abandon his round-the-world attempt. For most people, that this would be the point where the story ends. Not so for our Norman. Rather than return to Larne with his tail tucked between his legs, the determined Larne man made the decision to continue his journey. Last October, having spent almost four years tucked up in a Japanese hangar, Roxy was loaded into a container and shipped across the Pacific Ocean to the USA. Since then, the aircraft has been housed at the Evergreen Aviation and Space Museum in Oregon, which is best known as the permanent home of the mammoth Hughes H-4 Hercules, famously known as the ‘Spruce Goose’. On Monday, June 1, Norman and Roxy finally commenced the next phase of their journey; a coast-to-coast flight across the USA. Speaking to the Times ahead of the relaunch, Norman said: “Roxy has been on display at the museum for the past six months. “We have been very fortunate to have spent our temporary winter billet surrounded by such iconic and famous aircraft on permanent display. “I now have an idea of what it must feel like to be one of the lesser side show attractions at a travelling circus and think perhaps I should really be busy dancing a little jig or telling a few jokes to entertain the folks who happen to be passing by. “Many thanks again to the Evergreen Aviation and Space Museum for proving to be such perfect hosts. “As of this week, we will no longer be just a museum exhibit, and will finally be free to take to the open skies once again. “I am looking forward to our next flight, the one that has kept me focused and occupied in recent years. The USA phase of his expedition will see Norman hover from Portland Oregon on the west coast, to Portland, Maine on the east coast. The journey, which is estimated to last three weeks, will take in famous landmarks including the Rocky Mountains, Yellowstone National Park, Mount Rushmore and Niagara Falls. Norman explained: “From Portland, Oregon, the route will head up to the mighty Columbia Gorge, before turning south east to follow the Snake River and north west to pass by the ‘Craters of the Moon’. “Hopefully, we are then able to overfly Yellowstone and then on eastwards to take in the sights of Bighorn, Thunder Basin and the Black Hills of South Dakota. Mount Rushmore is also close by here. “Crossing the Missouri River the easterly progress is maintained through the wide agricultural expanses of the mid-west, through Minnesota and Wisconsin to reach Oshkosh, home of both a world renowned aviation museum and a huge annual fly-in air show. Once he reaches the east coast, Norman’s route will take him north to Canada, before he hops across the north Atlantic via Greenland, Iceland, and the Faroe Islands. He will then be in the home stretch, arriving in the Outer Hebrides and making his way down the west coast of Scotland and across the Irish Sea to Garron Point. The final leg of Norman’s emotional, five-year journey will see him fly south along the Antrim coast to Larne, where he will touch down in Sandy Bay to a rapturous welcome from his legion of supporters.